With all that was going on last week I forgot to post the end of September finishes montage. These are all the finishes that made it into September. You will notice in it that the Rainbow Chevron Blanket and the set of cloths I was aiming to finish up last Monday did indeed get finished in September. 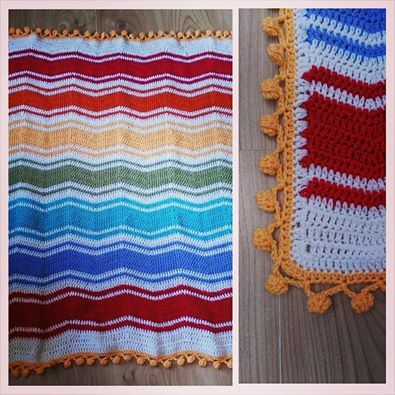 Taking a quick look at the Rainbow Chevrons Blanket now, here is a picture of it finished. I will be doing a blog post on this and a look at the other two later this week, so do check back to see that. As you can see I opted for a yellow bobble edge this time to finish it off and all three have been gifted to the intended triplets. The Mint stripe cloths I finished as well last Monday, really only having one cloth left to do and being unable to move around and do things freely meant it was the perfect time to try and finish some items. This is a simple pattern I made up as I went along and the project page here explains what I did. Projects that have been worked on this week are the border of the Ériu shawl, I should be near finishing that this week with just blocking left to happen on it. I have worked on Elizabeths Miss Marple but forgot to take a picture will do that this coming week. I have been working steadily also on my first tutorial article that I was explaining about last week. Working up the samples I want to photograph, I’m hoping in a few weeks time I will be able to share that with you all. I have also started and finished another set of cloths, these ones just named Mint Cloths and using the same colours as the above set. Again these were based on the above cloths notes and the notes and project page for this can be found here. 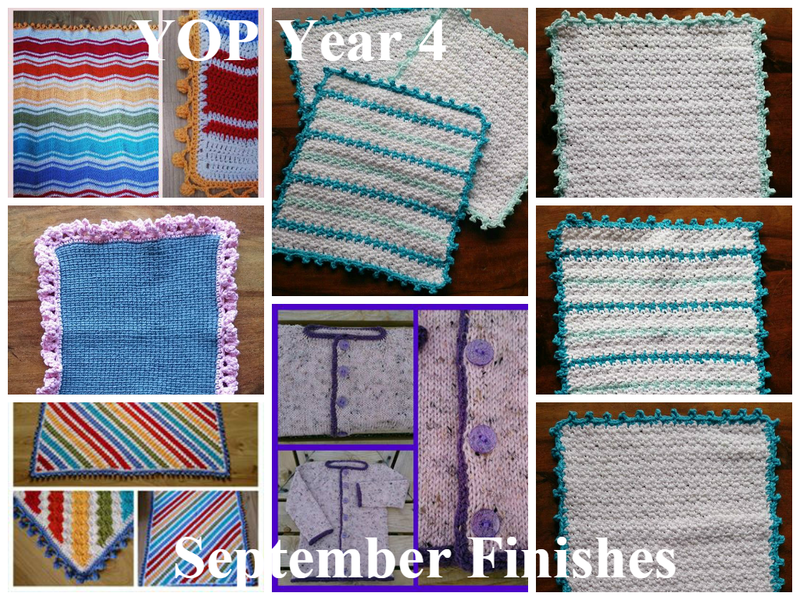 My YOP projects page on ravelry is now up to date with projects and notes and can be found here. To read other blogs taking part in the yop year or to take part yourself please find us on Ravelry here. This entry was posted in Crochet, Designs, Finished object, Year of projects and tagged Mint Cloths, Mint Stripe Cloths, Rainbow Chevrons Blanket, September Finishes. Bookmark the permalink. Love the edging on the Chevron blanket. Your cloths are so nice too. Hope you are feeling better and the leg is not bothering you too much. I love the chevron blanket and the little set of cloths is gorgeous. I’m very impressed with the consistency of them!! Thank you for the tutorial that finished them off beautifully. I’m getting there but it’s hard mastering them and I don’t get very far without getting tired on them which is a pain. 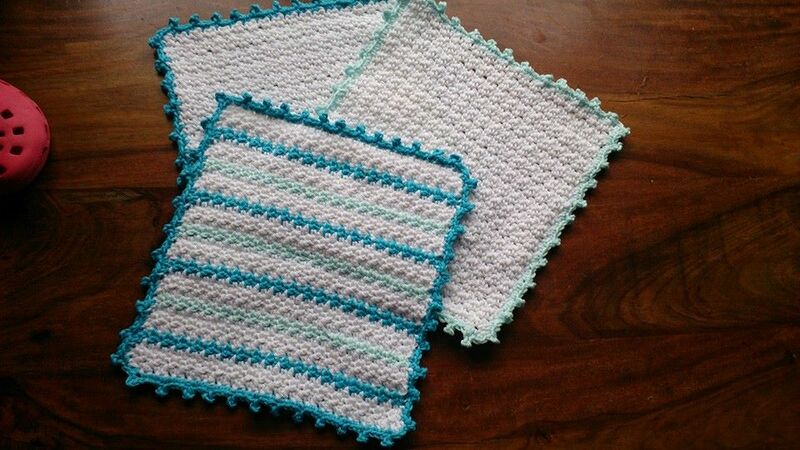 Your washcloths are lovely… Makes me want to make some! 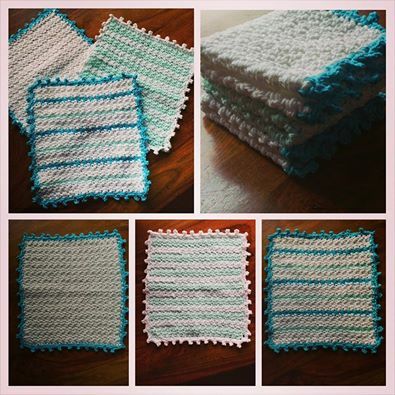 The blanket came out great…and what a great assortment of cloths…..
Love the mint stripe cloths. There is something beautiful about a set of cloths with coordinating colors.